They come from all walks of life, from all over the world, for many different reasons. For each of them the pilgrimage is unique and personal, but they all share one commonality – faith. And they come by the millions, twenty-four hours a day, every day of the year, waiting and praying in long lines leading up a mountainside in France, hoping for a miracle. Recently, Nick Cerbo of Saint Philip’s Church in Greenville became one of those pilgrims and traveled to Lourdes, France, a spiritual place known throughout the world for miraculous healing. Nick is a 20-year-old sophomore at Saint John’s University in New York City studying psychology and theology, and hopes one day to be able to help troubled children. Lourdes has been a religious destination for those suffering various afflictions since 1858. On February 11th of that year, 14-year-old Bernadette Subirous, (Later Saint Bernadette), her younger sister Toinette, and a friend, were looking for firewood near a naturally formed grotto in the side of a rocky cliff. It was there that Bernadette experienced the first of eighteen visions of the Virgin Mary. Since then, the water that flows from the grotto has been associated with miraculous healings. The trip to Lourdes was sponsored by the university, and Nick was one of eleven students and three chaperones chosen for the journey. Yet going wasn’t simply a matter of signing up. “We had to fill out applications.” Nick explained. “Thirty-five students applied, but only twelve could go.” Questions on the applications included citing one’s reasons for wanting to go, and about one’s faith and their relationship with Mary. Nick’s not sure how the selection committee made their decisions, but he’s very grateful for the opportunity. Each in the group had different reasons for wanting to go. For Nick it was a chance to grow in his faith. He’s been involved with the St. Phillip’s youth group and other church activities, and says he felt drawn by the Holy Spirit to go. During our interview, he spoke of the fourth station of the cross, where Jesus is carrying His cross to the site of His crucifixion, and He meets His mother, Mary. Nick has a devotion to the Blessed Mother, and metaphorically speaking, we all have our crosses to bear. Therefore, he saw it as an opportunity to meet Mary and carry his burdens to her. In preparation for his trip, he placed a book containing blank pages in the lobby of St. Phillip’s Church. At mass it was announced by St. Philip’s pastor, Father Francis Santilli, that any parishioner who wished to do so, could write their prayer intentions in the book, which would be brought to Lourdes and placed before a statue of the Virgin Mary. According to Nick, many took the opportunity to write (anonymously) in the book. The prayer requests covered a broad spectrum, ranging from asking for help with certain difficulties they or their loved ones were experiencing, to cures for various ailments, to general prayers for peace. He saw it as a way to bring other people’s burdens to Mary and ask for Her intercession on their behalf. 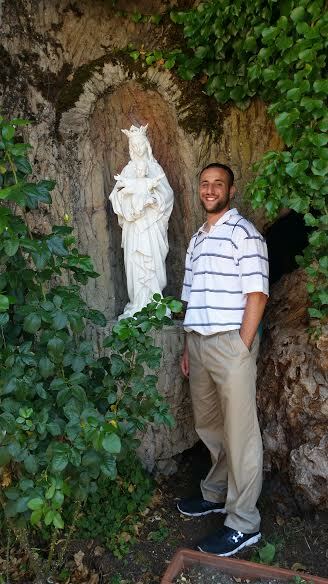 When he got to Lourdes, Nick placed the book in a basket located in front of a statue of the Virgin Mary. The basket is there specifically for pilgrims to put pieces of paper containing their prayer requests. “I put the book in the grotto and prayed over it,” he said, “and we had mass everyday, and we prayed for our intentions and all the intentions other people gave us.” The prayer intentions are collected each day by local nuns who burn them as a way of offering and protection of people’s privacy. According to the Lourdes website, six million travelers come to Lourdes each year. Nick witnessed the long lines of people first-hand. “There were thousands of people there from all over the world praying in different languages,” he recalled. “I never felt so insignificant. It made me realize just how world-wide the Catholic religion is.” And despite language barriers, everyone seemed to generally understand each other, for they were all there for a common purpose. “There are places where people can bathe in the waters,” Nick said, and he went on to explain how his group had volunteered to help those wanting to be immersed. They each wore special Polo shirts to designate their volunteer status. Wearing robes or bathing suits, those entering the baths gratefully accepted the offers of help for many were battling infirmity or disease. Some had come with family or friends, while others were all alone, and many carried rosaries. “When the people came out of the baths they cried a lot,” he recalled. While Nick didn’t witness any healings first-hand, he saw empty wheelchairs, canes, and crutches left behind by those who had. He also saw a lot of Rosary beads draped over statues of Mary and Jesus in the Stations Of The Cross area. The first documented healing occurred not long after Bernadette experienced her first vision. Mrs. Catherine LaTapie had suffered a severe hand injury which left two fingers on her right hand paralyzed. When she submerged her hand in the water outside the grotto it was instantly healed! Over the years, thousands of people have reportedly claimed to have experienced unexplainable cures from all sorts of maladies including physical deformities, chronic illness, and cancers. As of this writing, the Catholic Church has recognized sixty-nine of them as miraculous. As a point of fact, this was not Nick’s first trip abroad connected to his faith. In 2013, he and other members of the St. Phillips Youth Group went to Jamaica with Father Nixon to volunteer at an orphanage. It would seem that those who visit Lourdes come away with a stronger sense of spirituality. Nick told me he definitely felt Mary’s presence, and had found what he had hoped for, a chance to grow in his faith. That growth has given him a better understanding of his own cross that he’s been carrying since his youth, for he has a stutter that at times makes it difficult to speak. If one is so inclined, they can take water from the healing spring with them, which Nick did. During the interview he presented me with a small bottle of holy water from Lourdes. Holding it in my hand, I thought of the millions who have traveled to France just to touch what I had in my hands. I thanked him for the gift, for as a Catholic I believe in what the water can do. With Nick’s permission, I passed it along to someone who is battling cancer. Filed Under: Articles Tagged With: Lourdes France, Nick Cerbo Smithfield R.I., St. Philip's Church Greenville R.I.